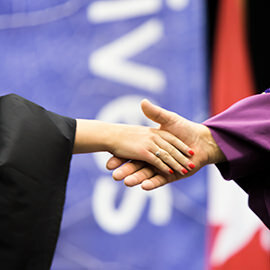 WATERLOO – Wilfrid Laurier University will hold its spring convocation ceremonies on the university’s Waterloo campus June 13 to 17. As of May 31, approximately 2,800 students had met all program requirements and qualified to graduate. Laurier expects to confer 269 graduate degrees, 2,523 undergraduate degrees and eight diplomas, two graduate and six undergraduate. On average, 80 per cent of Laurier graduands attend convocation ceremonies. The university will hold nine ceremonies in Waterloo. Three ceremonies were held in Brantford on June 7 and 8. Honorary degree recipients include William Downe, CEO of BMO Financial Group, Astrid Janson, award-winning production and costume designer, Lillian Allen, a pioneer of dub poetry, and Peter Wilkinson Howitt, a renowned economist.